Gurkha Company at the Infantry Training Centre Catterick, is where Gurkha Trainees are turned into Gurkha Soldiers over a nine month period. The instructors came up with the idea of doing a Junior Non Commissioned Officer team bonding event to show good example to the trainees by attempting the Tough Mudder Half Mud Run Yorkshire for the Gurkha Welfare Trust. On 29th July at 0900hrs, the Gurkha Company permanent staff gathered at Bhanu Square. 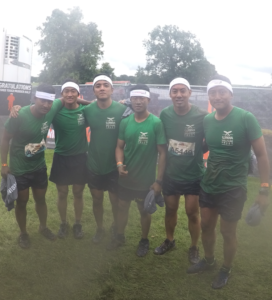 They were to run the 5 Mile Tough Mudder Half to raise money for the Gurkha Welfare Trust. There was a mass start at 1300hrs, downhill with muddy trails along the way. It included jumping a muddy ditch as one of the first natural obstacles. There were some world-famous obstacles with great names including; Birth Canal, Everest, The Blockness Monster, Pyramid Scheme, Mud Mile & Berlin Walls. The team also had to pass through many streams. One after another the obstacles were overcome. Each Obstacle had its purpose and great teamwork was required. The team trained hard prior to this event and it was clear that the benefits of that training paid off. The team would like to thank everyone who supported the team to raise £255 for the Gurkha Welfare Trust. The team would also like to thank Corporal Kamal (PMC Gurkha Company) who funded us £50 from the Junior Non Commissioned Officers’ Mess which helped us to attend the event. Lastly, we would like to thank Gurkha Company CHQ who supported us.